Nokia is releasing their latest addition to the E-series business phone line. 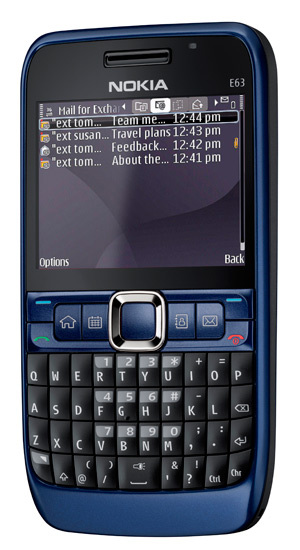 The E63 joins the E71 in giving users media rich mobile internet and a QWERTY keyboard. The main difference between the current E71 and E63 is the price. The E63 costs 199Euro as is. Carrier subsidies may put it down to 100-150 Euros, making it the cheapest smartphone on the market. 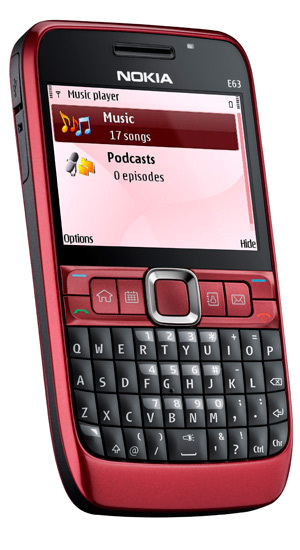 Features are mostly the same with the E71 but with a vey big catch, no 3G. Features include, 113 x 59 x 13-mm / 126g form factor, 320 x 240 pixel display, quad-band GSM / EDGE with 660 minute talk / 432 hours standby, microSD memory slot with 110MB internal memory, 2 megapixel camera capable of QVGA video @ 15fps, and of course, Bluetooth. It’ll also be released in WCDMA 900/2100, 850/1900, and 850/2100 configurations. To compensate for the 3G, the E63 will be released in two funky colors, ruby and blue (aquamarine).